I may be a typical early 60s Baby Boomer in that I refuse to admit to aging. “I can still do everything I could when I was in my 20s!” I often tell myself. I decided to test myself at the Adventure Park at the Virginia Aquarium. Happily my older daughter Laura volunteered to come along. Debbie decided she had better things to do that day. When we first got there we were outfitted in the getup you see above. Very secure, and tight, we were ready for our training. The nice thing we discovered is that it would be extremely hard to hurt yourself. We would be traversing trails amidst the trees and would always be securely attached to steel cables, usually two attachments. It’s impossible to unhook both when you’re up on the trail; you’re always hooked in with at least one. Training on hooking and unhooking ourselves and how to use the zip line completed, we were ready to go. We climbed up a central platform and had multiple choices of trails. The trails are color coded by degree of difficulty. I started off on the second lowest to check things out. It was plenty challenging! Yes, you walk across that! Once all hooked in, off we went. Laura started off at a higher level and never looked back, or down, except for this picture. I stuck with the blue and green levels, never getting more than 25-30 feet off the ground, whereas Laura, being young, ended up on a black diamond level, which involved a zip line across a creek. I tried out my first time zip lining and it was very refreshing! It didn’t go too far and I didn’t end up stranded in the middle so I was pretty happy. Actually, among the two most frightening adventures was one where you grab a rope and hop off a platform, hoping that’s what you’re supposed to do (it was). The second was hanging by a trapeze while swinging through the trees. I have a slight fear of heights, so I was curious how I would handle that. Knowing there was no way I could fall, that never came into play. Of course, if I had gone 50 feet up, that might be a different story! I was done, and drenched, after about 2 1/2 hours of the allotted 3 hour time slot, so I enjoyed watched others traipse across the trails while Laura disappeared into the woods for a couple more challenges. It all ended well for me; I was able to make my way across some very challenging trails and not wimp out. No problems, other than dropping my camera, which luckily landed softly in some plants and was retrieved by a staff member. My next challenge may be a Creeper Trail zip line this fall. Then maybe motocross? When our daughters were young, we often took them tent camping. We mostly went in warmer months and had a lot of fun, even when it rained (which it often did). Well, the summer of 2016 rolled around and we decided it was time for a camping trip. This time, though, there would be, in addition to 2 daughters, 2 sons-in-law and 4 grandchildren, ranging in age from 4 to 17 months. This, as you can probably figure from the picture, precluded a tent. Air conditioned cabins it was! We decided on the Jellystone Park near Natural Bridge in the mountains of Virginia. This ended up being the perfect campsite for the grandkids and adults, with lots to do. The cabins worked out great; we especially liked the air conditioning, considering this was one of the hottest weeks of the summer! Our home for 3 nights. Note the air conditioner! Happily, the grandkids and adults all had a grand time. The kids took turns with dinners, and the grandkids had fun wandering among the three cabins we had, visiting whoever was in there. We spotted Yogi Bear at the ice cream social, and helped Cindy Bear with the Pledge of Allegiance. Cortlyn gives Cindy a good morning hug. There were just a few people taking pictures! There was a water park, pool and “swimmin’ hole” that we all enjoyed greatly. One family played miniature golf while others relaxed. 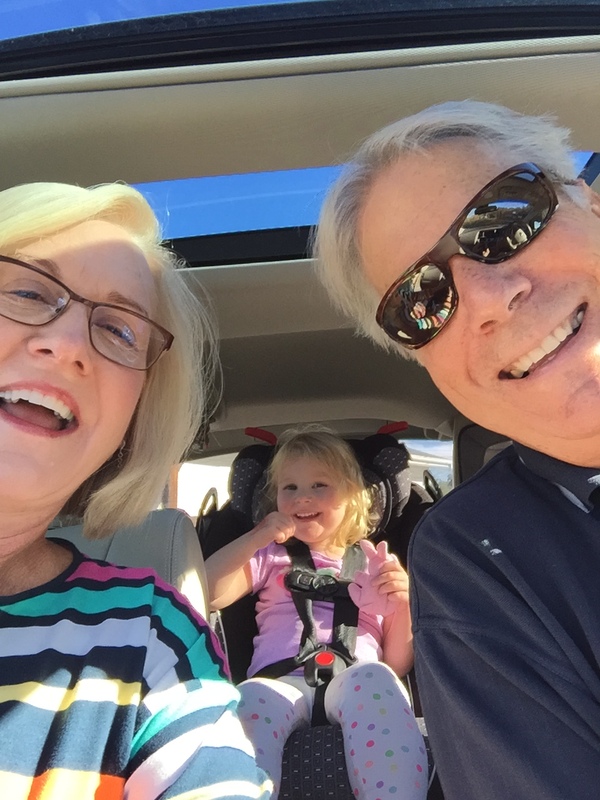 I had fun taking 3 of the grandkids to the playground, which gave us a chance to check out all the RVs that were there. The highlight of the trip was the visit to Natural Bridge. We had taken our girls there about a quarter century ago, so they were anxious for their spouses and children to see it. They weren’t disappointed! It’s still a majestic sight. New to us this time was a Native American village. Overall, we had a terrific time and Debbie is planning next year’s get together now…either the Poconos in Pennsylvania or a resort at Massanutten Mountain. To be continued! 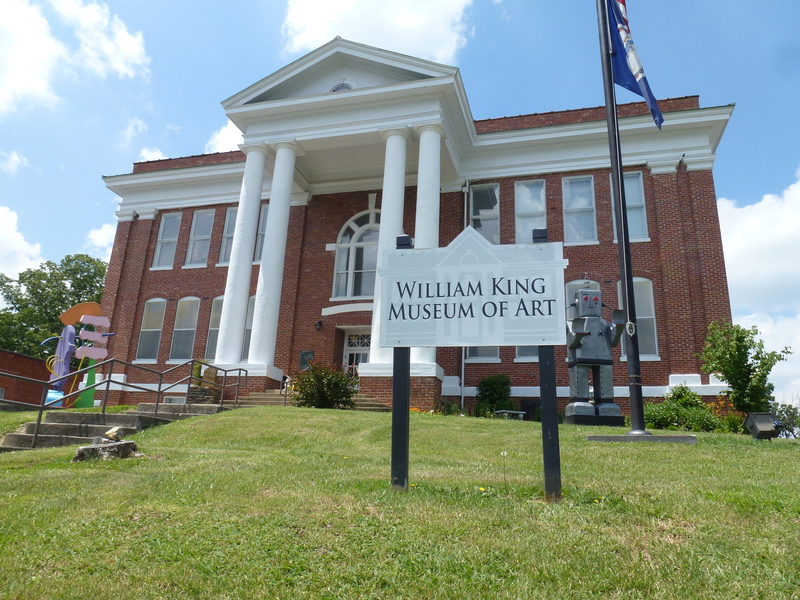 A highlight when we’re staying in Abingdon is a visit to the William King Museum of Art. Set in an old school building, there is always something interesting to view. 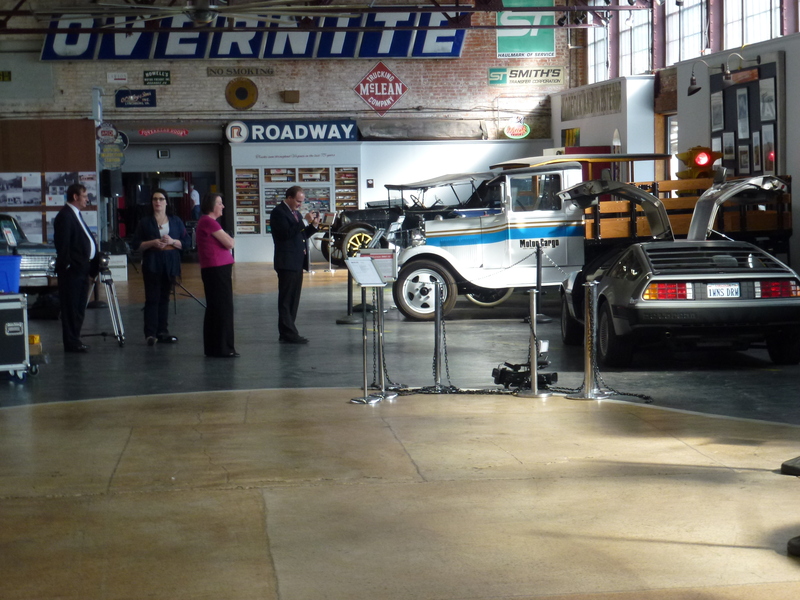 On our most recent visit in early June, there were three extraordinarily interesting exhibits. 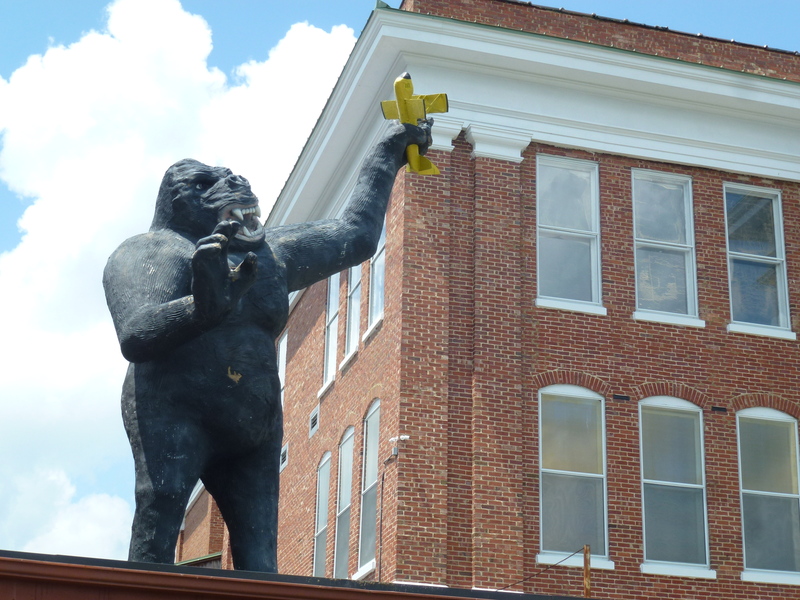 You get a hint at one of them from the outside…an unexpected visit from King Kong. Something you don’t always see at an art museum! It’s an introduction to “Roadside Attractions: The Weird and Wonderful Worlds of Mark Cline”. Mr. Cline is a native Virginian who creates an array of fantastical creatures which adorn everything from haunted houses to miniature golf courses around the country. The exhibit is as imaginative as he is, and gives us his history, both the ups and downs. This exhibition is on display until June 26. On an entirely different level is “Normal: Nazi Germany in Found Photographs”. These are found photos of anonymous Germans and shows their lives living under the Nazi rule. It’s dramatic and sobering. To quote from the exhibit, it “asks us to consider what human beings are capable of when the fundamental principles of right and wrong are overthrown…”. This is on display until July 17. Upstairs, on a lighter note, !Viva Appalachia!. The culture of the area is becoming more diversified as the Latin-American population increases. The exhibit celebrates this diversity with a variety of multi-media art displays. You can catch this exhibition until August 7. Once you’re done inside, there are several pieces of art on display outside the museum. And you have a great view of Abingdon and mountains. 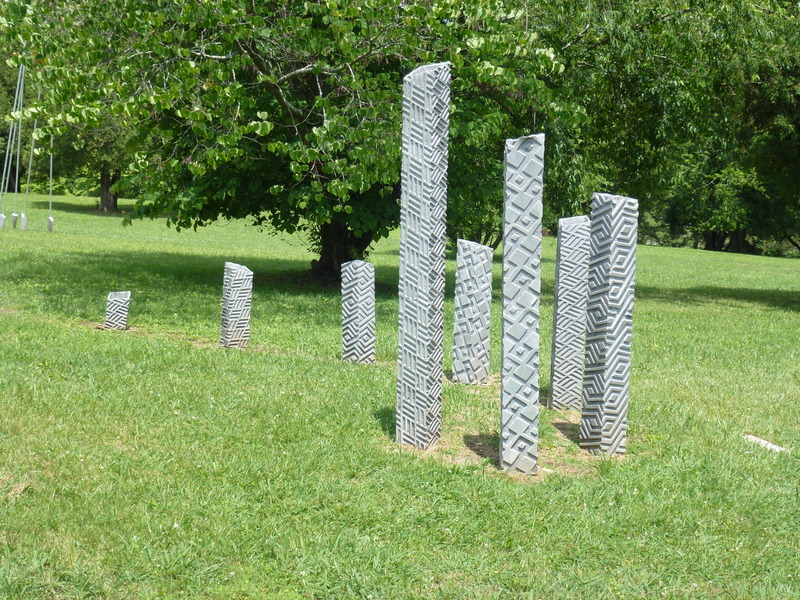 So if you’re in Southwest Virginia, be sure to stop by the William King Museum of Art. It’s one of the top attractions in the area and is sure to be a memorable visit. Let’s Visit a Winery. No, a Distillery. Let’s Do Both! 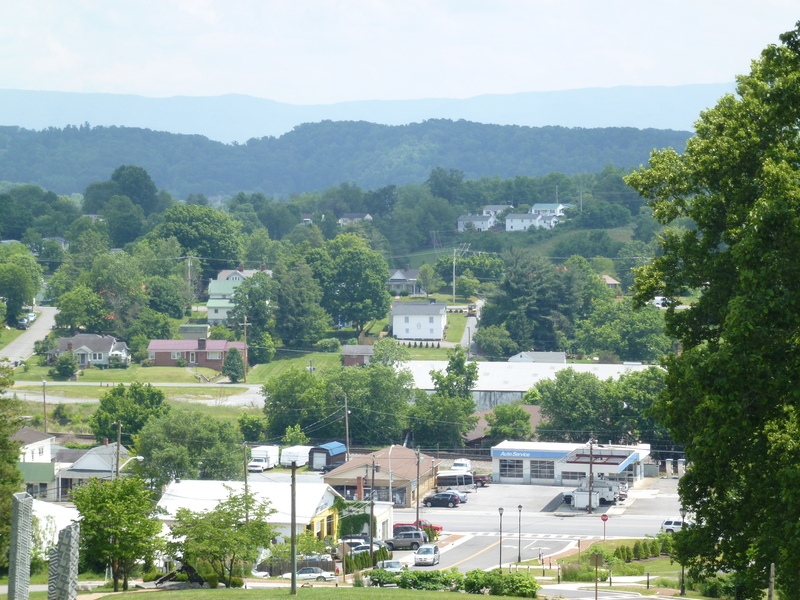 Although Northern Virginia and the Charlottesville area are best known for wineries, Southwest Virginia has a few, too. While staying in Abingdon, we decided to head a little north to the Rural Retreat area and visit Davis Valley. It’s not only a winery, but, surprise, a distillery, too. They are becoming more common in Virginia, despite a lot of hoops that owners must jump through to get going. 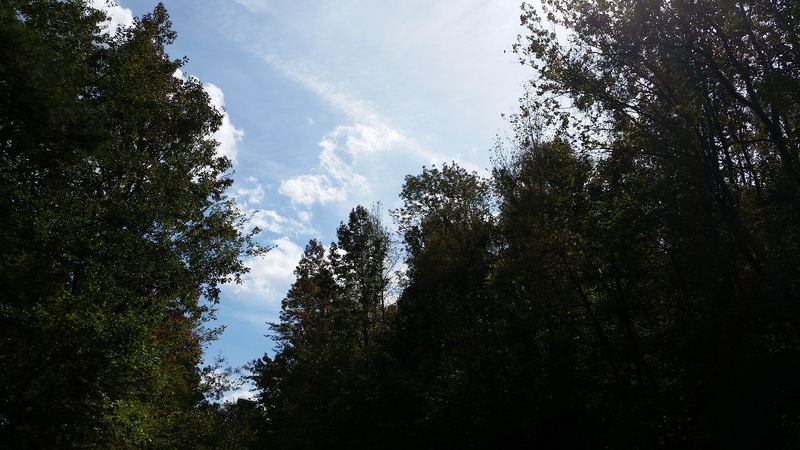 We exited Interstate 81 at Chilhowie, and proceeded up Route 11, the old Lee Highway. This is the more scenic route, even though it’s right next to 81 at times. About an hour later, we arrived at the very picturesque winery. The friendly staff was ready to let us taste some of their wines. 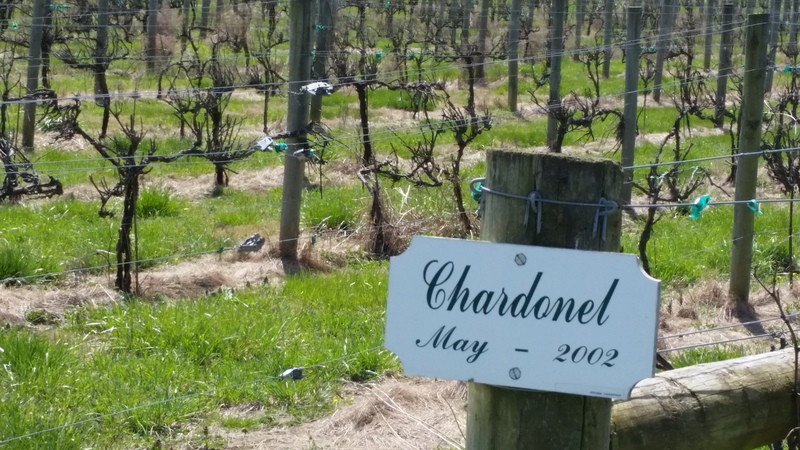 They have a variety of wines, from the sweet Virginia Breeze Red, to a really nice Chardonnay. From the tasting room, we were led on a tour of the distillery, which is in the same building. The owners are very excited about their bourbons, which will be ready very soon. What was ready to taste was the Virginia Frost vodka and, of course, the obligatory moonshine. They have a variety of moonshine flavors; our favorite was peach. We picked up a bottle of vodka and peach along with a couple bottles of Chardonnay. On the way out, we admired the view from outside the tasting room. The Davis Valley Winery and Distillery is a nice addition to the many attractions in Southwest Virginia. I’m sure we’ll be back! 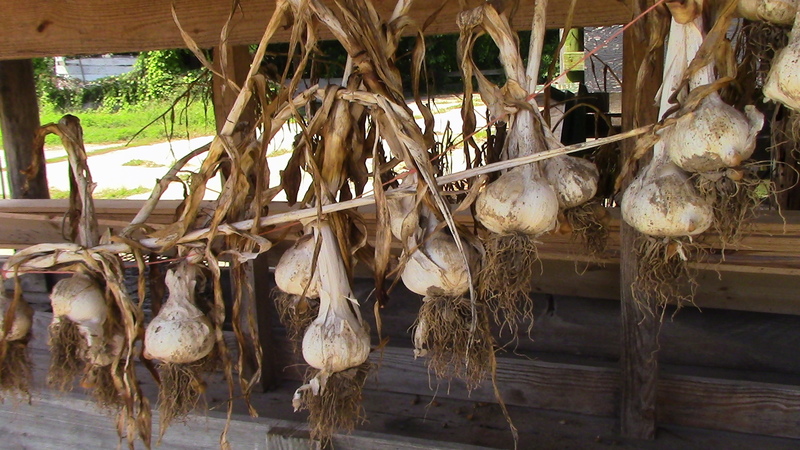 One of our favorite places to go when the weather is nice is the Norfolk Botanical Gardens. No matter what the season, there’s always something to see. The paths are easy to navigate and you can be assured of some natural beauty. It’s especially beautiful right now through the end of April with the introduction of LanternAsia-Art by day, Magic by night. The display consists of 36 magical illuminating works of art, crafted from silk, steel and other eco-friendly materials highlighting traditional Asian themes that include nature, wildlife, architecture and ancient folklore. These structures – some as tall as four stories – replicate those found in China, Japan, India, Thailand, Korea, Burma and Singapore. We went during the day, where we could see the detail and craftsmanship of these mystical works of art. By night, the experience is entirely different with all of the artwork lit up. This exhibit, which dates back to the Han Dynasty, is the largest of its kind in the U.S.
One of the most impressive displays is a temple made entirely of porcelain plates, cups and other items. It was constructed at the site and is amazing. The pictures don’t really do it justice. The exhibit is stunning during the day and sure to be gorgeous at night. We haven’t been yet, but here are a couple of pictures from the web site. With warmer temperatures in the offing, a visit to LanternAsia, day or night, will be quite rewarding. Anyone reading those knows immediately from where they come. 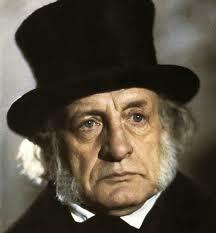 Of course, it’s Charles Dickens’ “A Christmas Carol”. It’s instantly familiar to most of us. I was first introduced to the story in 1962 when I was 9. It wasn’t the book, though, it was by way of Mr. Magoo! 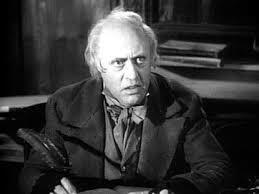 As the years went by, I watched various versions of “A Christmas Carol”, either as movies or made for television specials. I was thinking about all these recently. There are lots of theatrical versions this time of year, and I’ve always resisted going to them because I feel I have the story so memorized, there’s really no point in revisiting it. Then I realized I wasn’t sure if I had ever actually read the story. If so it was many, many years ago. 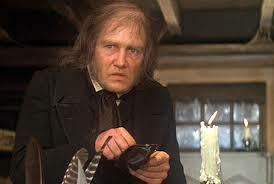 So I decided to actually read “A Christmas Carol”. It helps that it’s in the public domain, so it’s easy to find a free copy. I downloaded it on the Sunday before Christmas and dove it. What a treat! All the familiar plot elements and characters were there, but reading the story enriched and broadened everything. 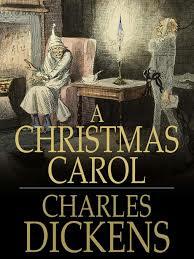 The descriptions Dickens writes, the dialog, the setting, brim with vividness that works best in the mind’s eye. From the first “Bah, humbug” to the last “God bless us, everyone” I was captivated. Tiny Tim nearly brought me to tears, even though I knew everything would turn out OK. The party scenes were written as though I were actually there. The ghosts are appropriately mysterious and scary, especially Mr. Marley. 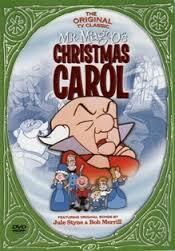 Scrooge’s turnabout was completely believable and logical. It was a real pleasure to read, and you can get through it in just a couple of days. 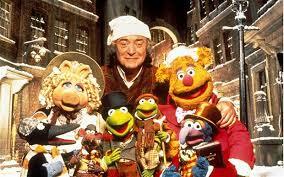 I would hardily recommend everyone read it next season and you’ll really get into the Christmas spirit! 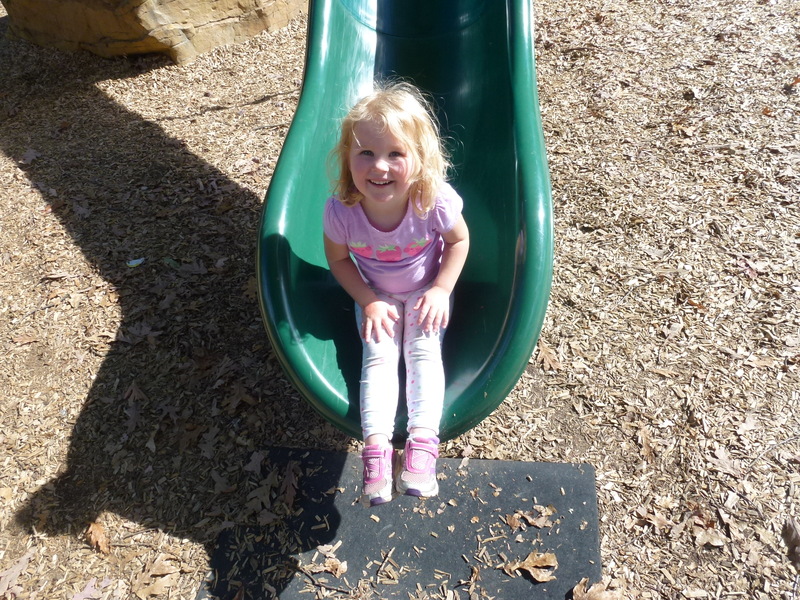 While out in Abingdon recently, we decided to take our 3 year old granddaughter Cortlyn on an overnight trip. A two-hour drive to Roanoke seemed doable, so we picked her up and off we went. It’s an easy drive up I-81 and Debbie kept Cortlyn entertained while Bill drove. No in-car DVD players for us! 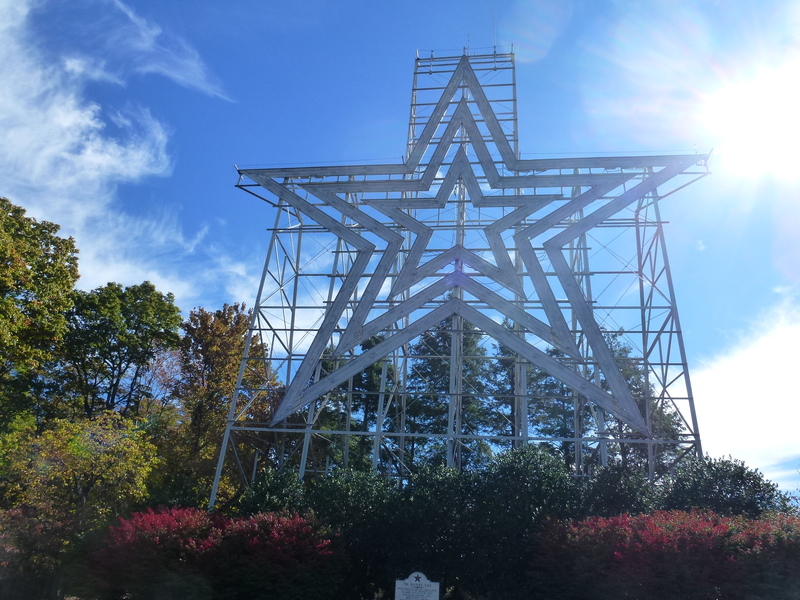 Once in Roanoke we headed straight for Mill Mountain to see the famous star, take in the city from afar and go to the zoo. As we headed for the zoo, we wondered why there weren’t many people there. 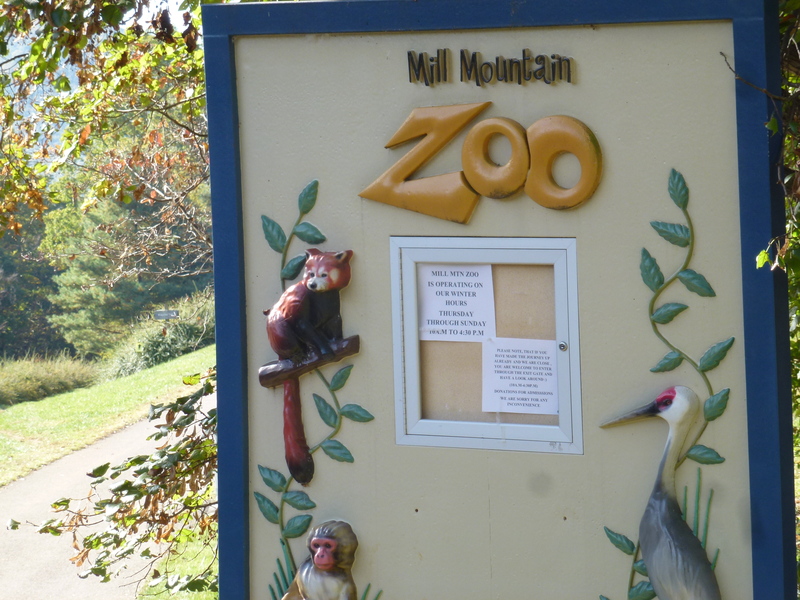 We soon discovered that the zoo was on fall hours and wouldn’t be open until the next day. So we made the best of it. 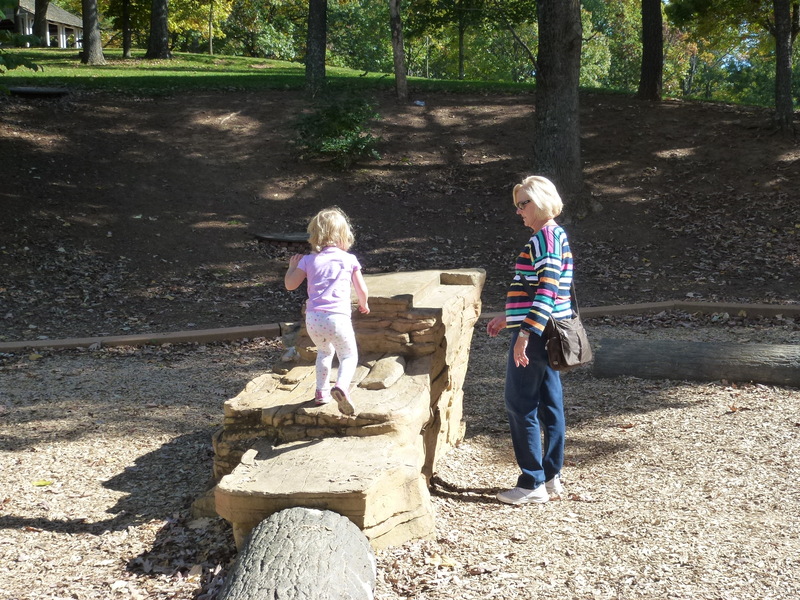 Luckily there was a small playground and a pretty nature trail that entertained our 3 year old just the same. 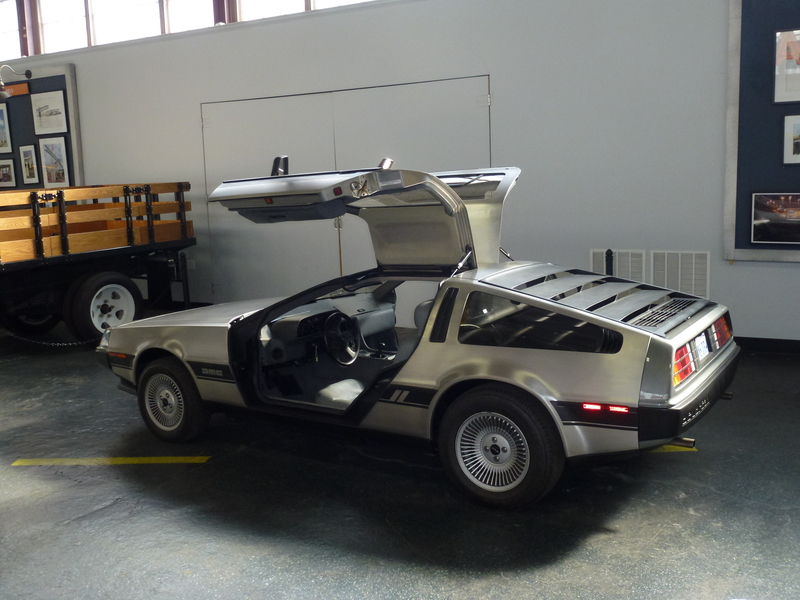 Our next stop was the Virginia Museum of Transportation. This is a really interesting museum with all kinds of transportation on display, from trains to autos to airplanes. 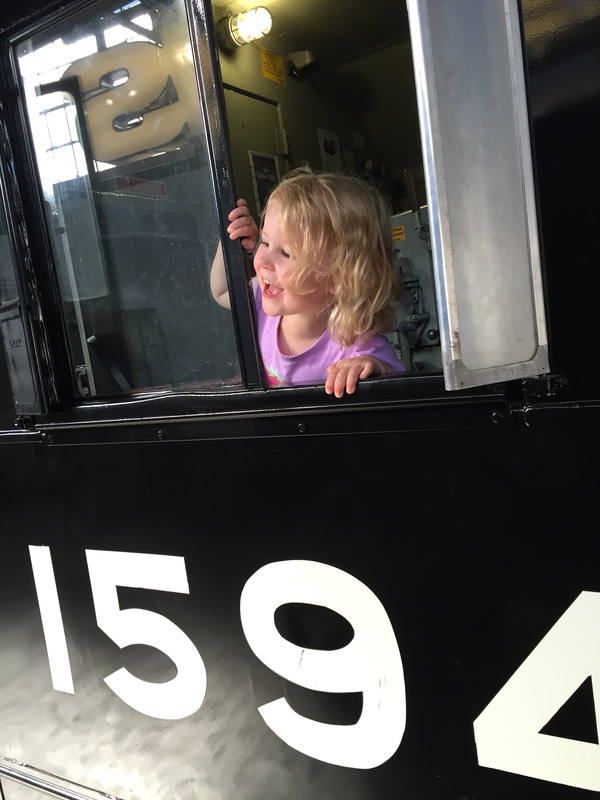 Cortlyn was able to climb into several trains and even a plane. They also have a model train display which no kid (including us) can resist. Cortlyn was pretty tired after this full day, so we went to our motel, which luckily had a pool for Debbie and Cortlyn (too chilly for Bill) and a hot tub for Bill. After an interesting time getting Cortlyn to go to sleep, we all woke up ready to go to the zoo. Happily it was open. 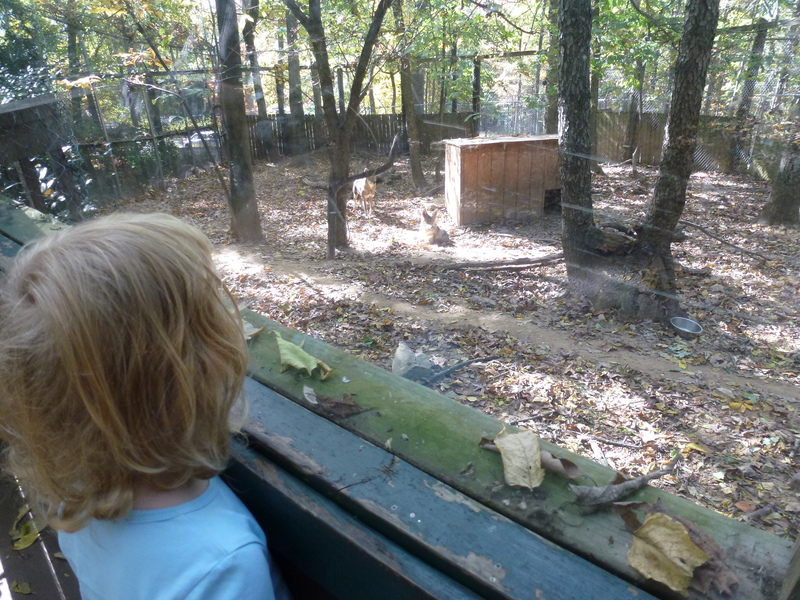 The Mill Mountain Zoo is fairly small, and several exhibits were under renovation, but still captivated little Cortlyn. She saw a Red Panda, Snow Leopard, and Red Wolves, among other animals. 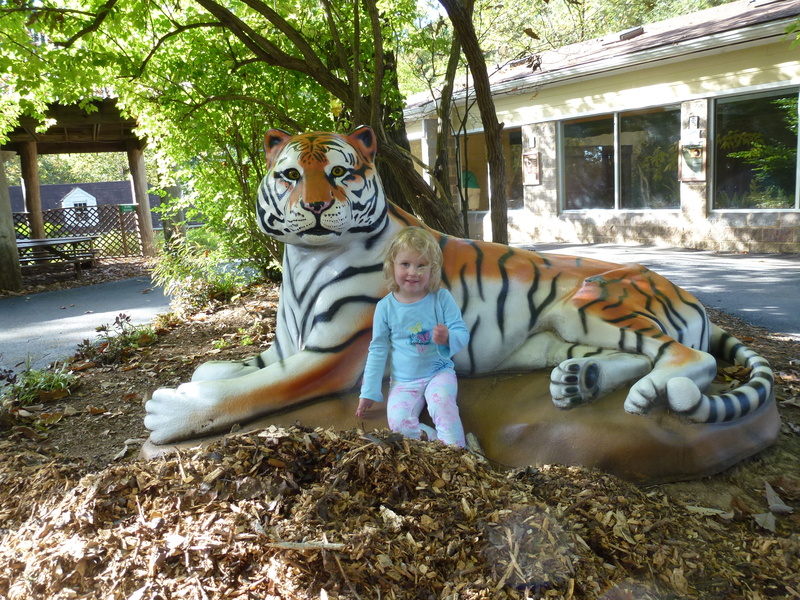 She posed with a tiger and again enjoyed the playground there. After the zoo, it was time to head back home. 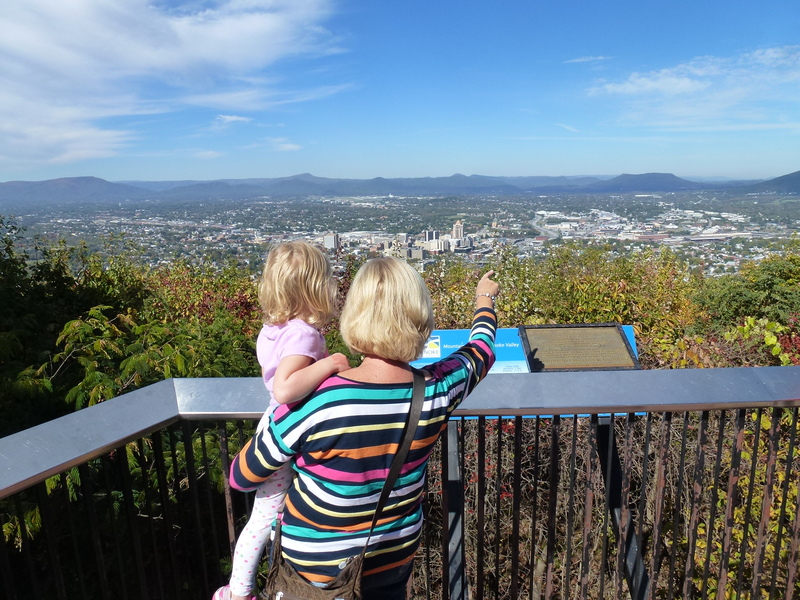 We had a fun trip with Cortlyn in Roanoke, and look forward to a trip with our other 3 year old grandchild, Tristan. Happy trails! River Park in Chesapeake, that is. The Northwest River Park is one of the nicest parks in all of Hampton Roads. 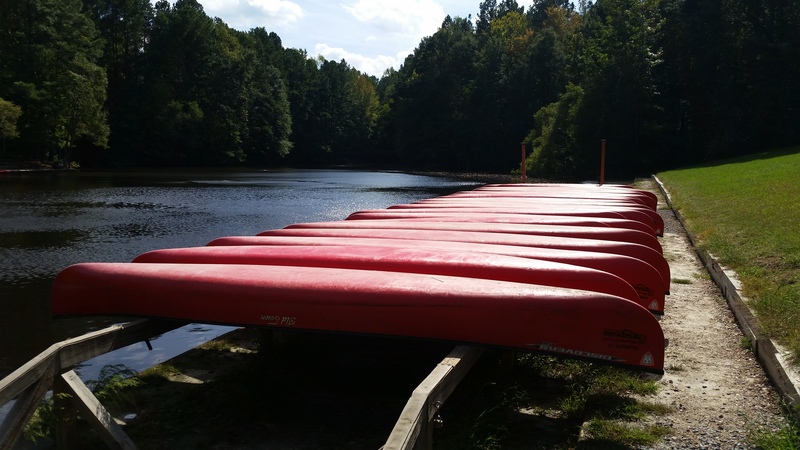 It’s also great for an easy canoe ride, so we took advantage of a warm, early Autumn afternoon and headed out on a 20 minute drive to the park. 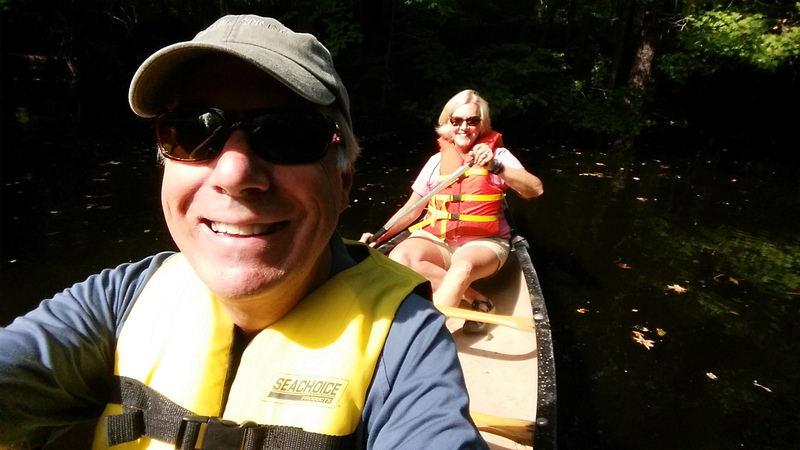 We had a choice of a canoe or a very sparkly paddle boat, so, since we once owned a canoe, we opted to use our upper body strength rather than our legs. Plenty of canoes from which to choose. 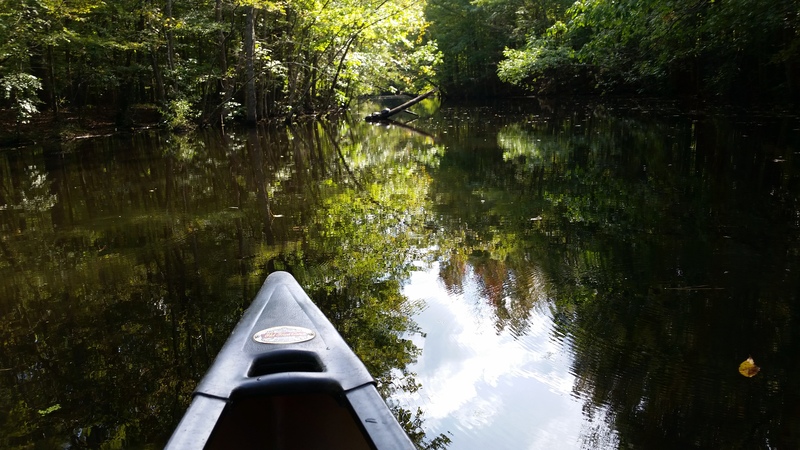 We paddled on a former drainage ditch that runs nearly to the Northwest River. If we had wanted, we could have landed the canoe and walked over to take a look at the river. It was an early fall day, so the leaves weren’t changing quite yet, but the wildlife also hadn’t gone into hibernation. 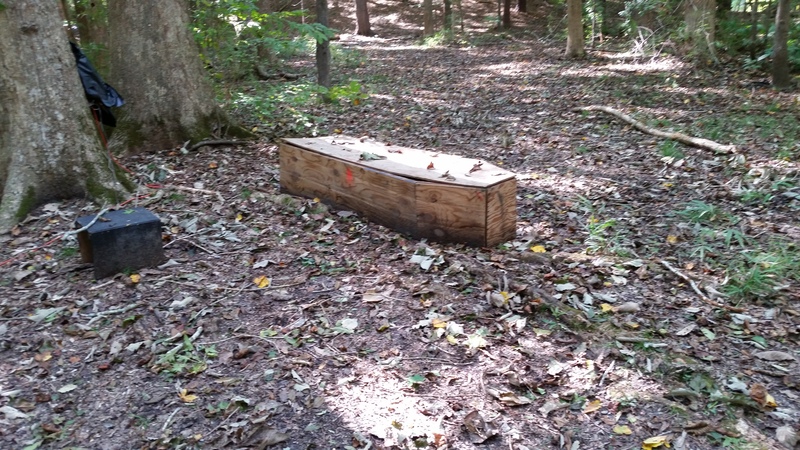 It could only mean one thing…it’s almost time for the annual, and extremely popular, Ghost Train! 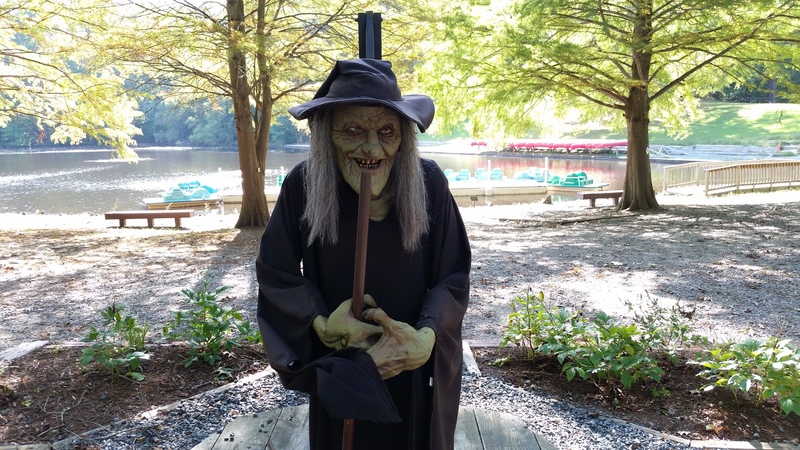 It runs evenings during October and promises to be scary and fun. 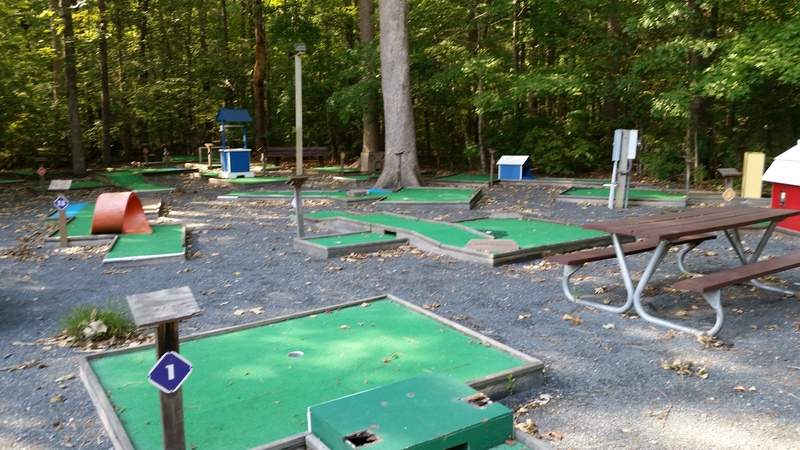 In addition to boating, biking (you can rent bikes) and picnicking, there is also a popular campground, open through the end of November, and even a mini-golf course. 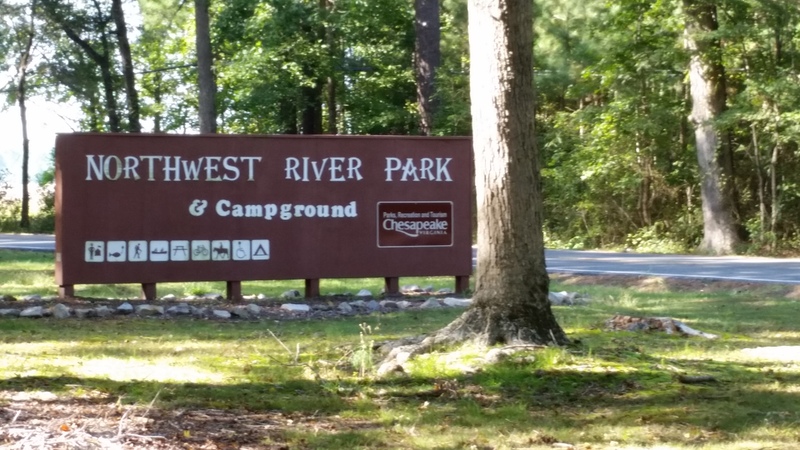 So for a fun day trip where you can be in the great outdoors, check out Northwest River Park. 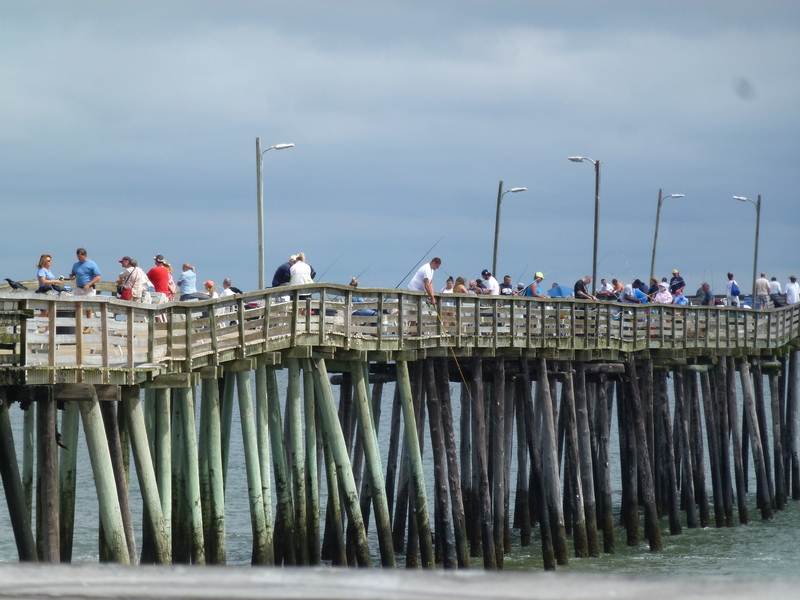 Like many Hampton Roads residents, we tend to avoid the southern oceanfront during the summer (although we spent a weekend there this summer). 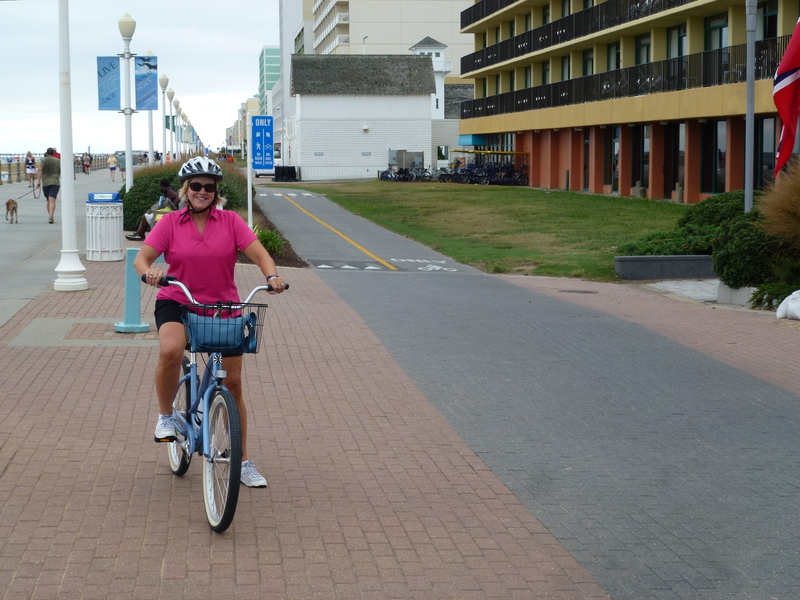 One of the most popular activities is taking a bike ride on the boardwalk. During the peak season, we feel like we’re taking our lives in our hands with all the bikes and buggies on the bike path. But after Labor Day, things calm down, and we decided to give it a try. Starting at the southern end, we headed north. There were still plenty of folks on the beach and walking on the boardwalk, but not so many on the bike trail. But still, we wore our helmets (and were about the only ones wearing them), and off we went. 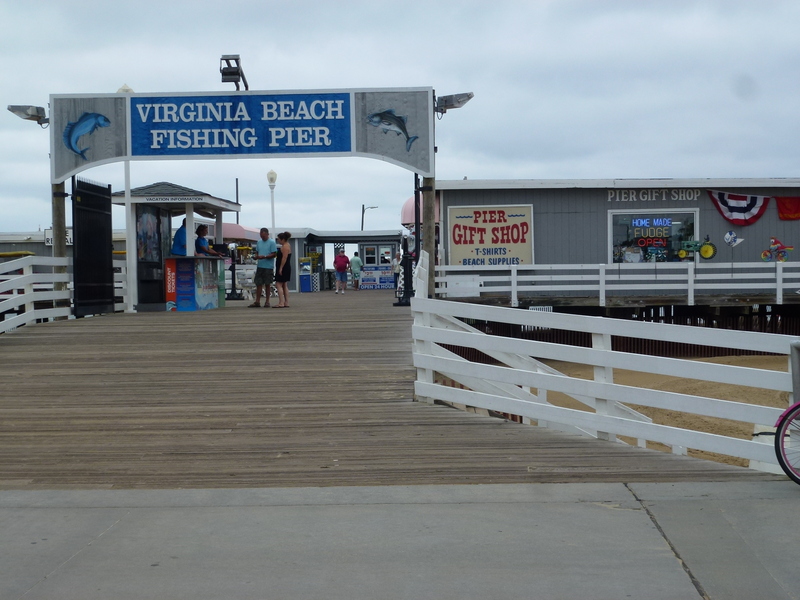 The boardwalk has been lining the beach for just about as long as Virginia Beach has existed. It started out as a wooden boardwalk and later concrete. 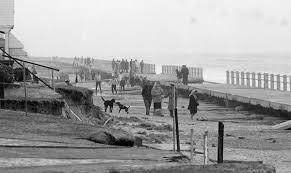 The Ash Wednesday Storm in 1962 really did a number on it as you can see below. It has been improved several times through the years and today, at three miles long, the boardwalk also serves as a seawall. 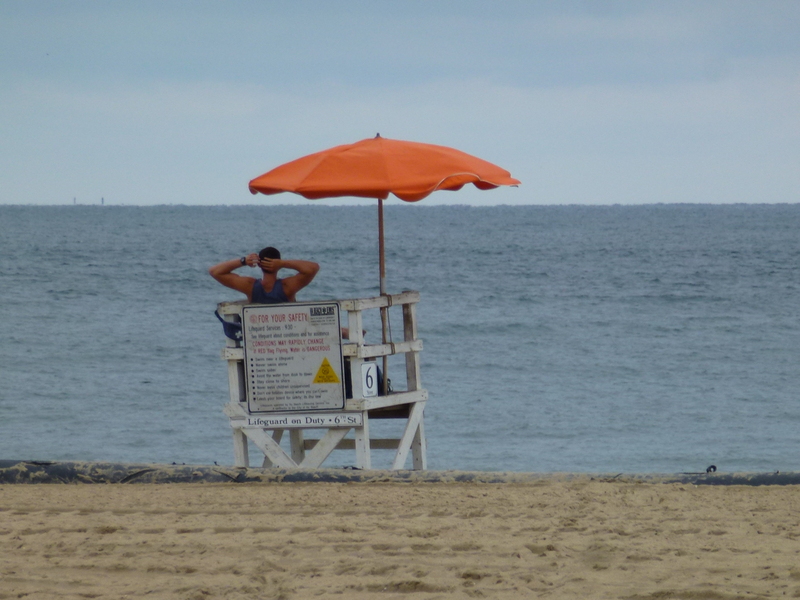 It has protected beachfront properties from several near miss hurricanes and nor’easters. But, back to our ride. It was cloudy and pleasantly cool as we headed north. 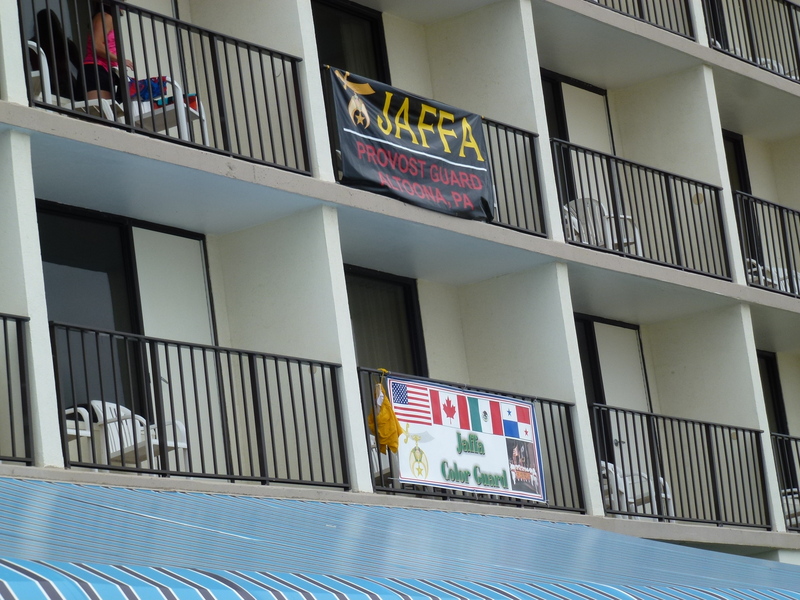 The Shriners were in town for their annual convention, so there were plenty of banners hanging over the railings highlighting where they were from. A few people rode 4-person buggies on the bike path. These are a little controversial during the summer season because they take up one lane of the path, and it can be a little tough passing them. But there weren’t too many out on this Friday, so we had an easy ride. And easy it is…pretty straight and quite flat. The main thing is to keep looking out for people crossing the path getting onto or off the main boardwalk. 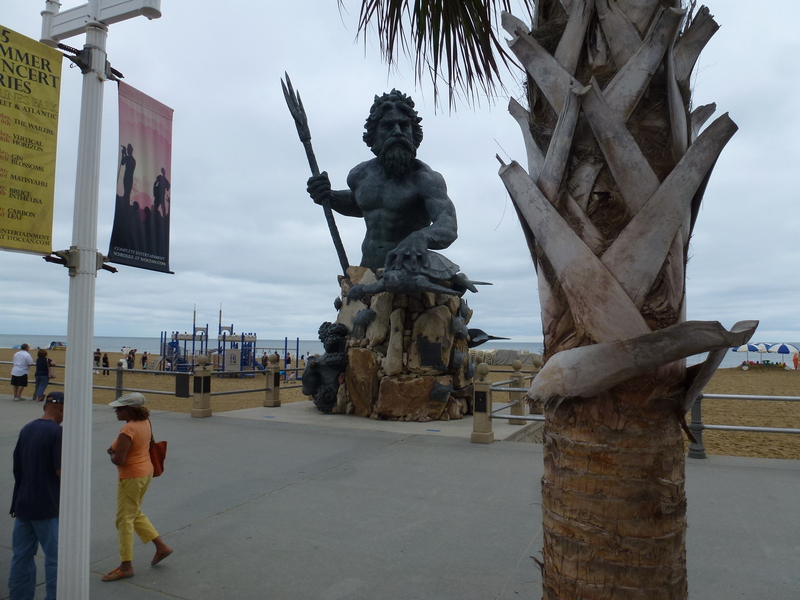 There are plenty of sights to see on the way, from the Norwegian Lady statue to good old King Neptune watching over the swimmers. 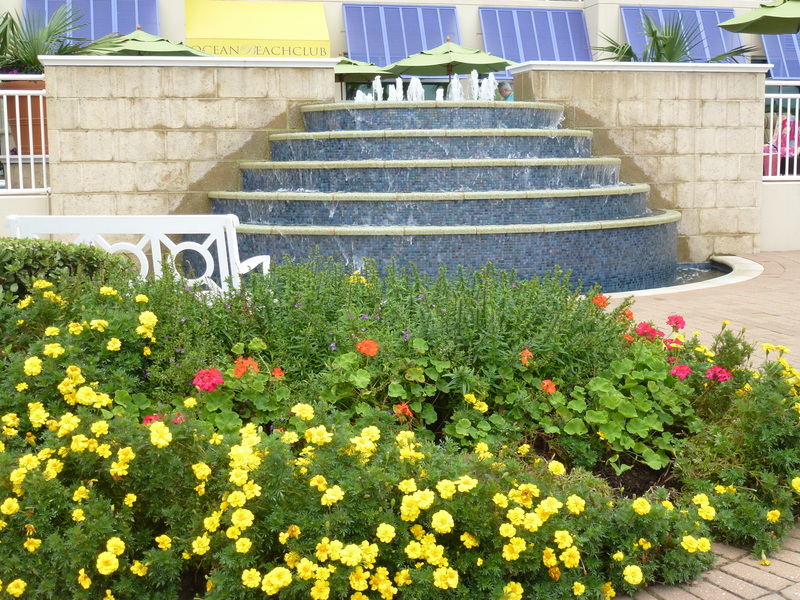 As we continued north, the landscaping at the hotels looked very lovely. 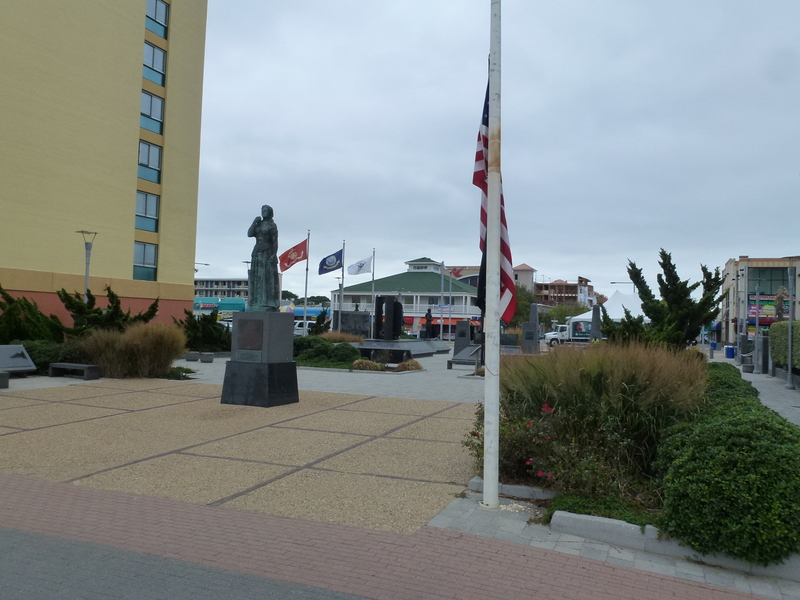 Kudos to the groundskeepers of the Virginia Beach hotels! 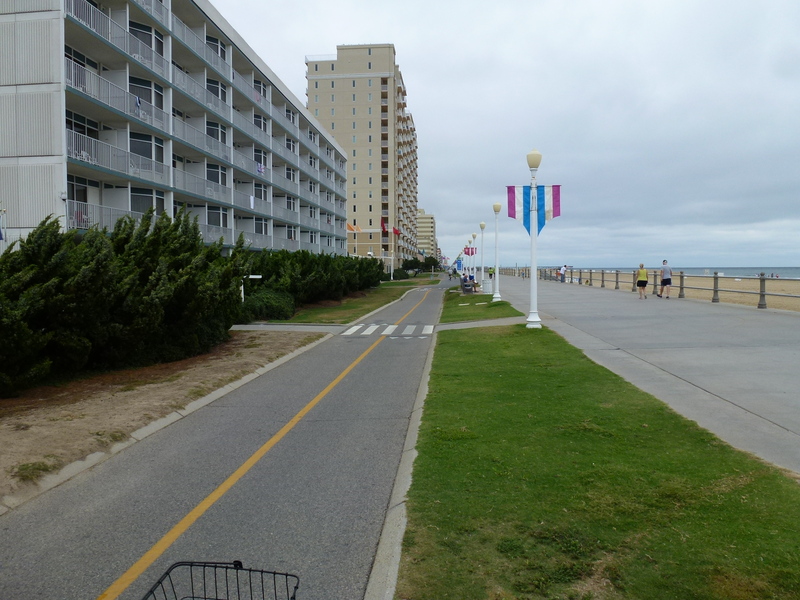 Once we got to the north end of the boardwalk, we hopped onto Atlantic Avenue for a few blocks and then got onto Ocean Front Avenue. This is a residential street that runs parallel to Atlantic Avenue but a little east of it. This is where you can see how the other half lives, with homes on the oceanfront costing well over a million dollars. 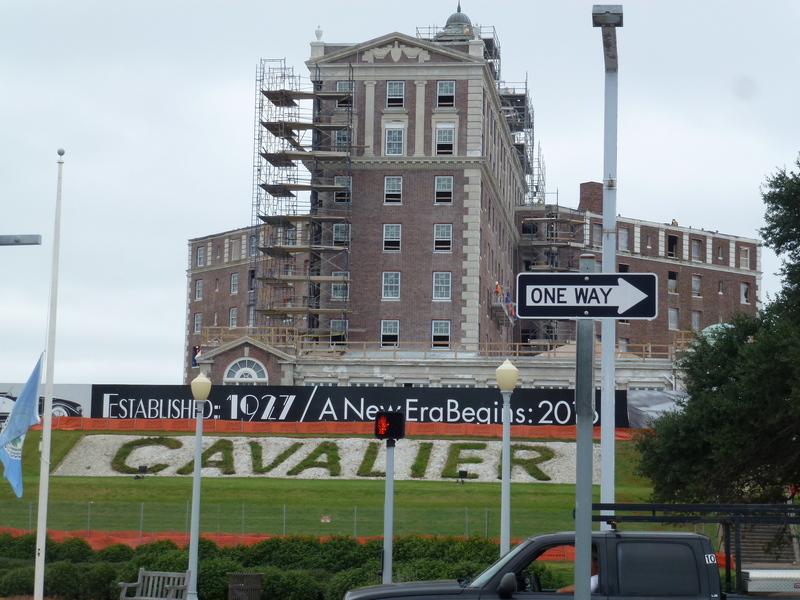 Heading south again, we stopped to take a look at the progress on the Cavalier Hotel. Built in 1927, it is being restored to its former glory. We’re looking forward to perhaps staying there once it reopens. We continued back on the boardwalk heading south. As we got close to where we parked our car, we decided to stop for lunch, not by the beach but over top of it. 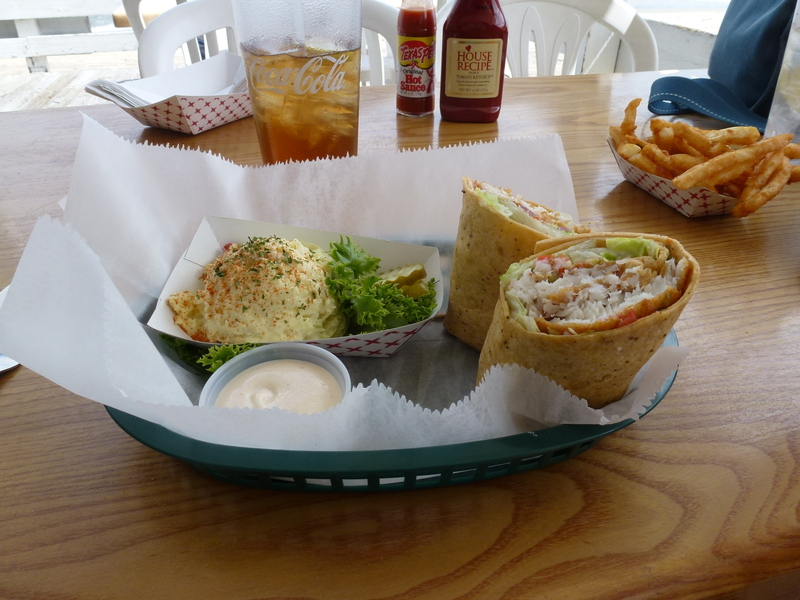 Ocean Eddies, located on the wooden Virginia Beach Fishing Pier, is a Beach landmark and should not be missed. 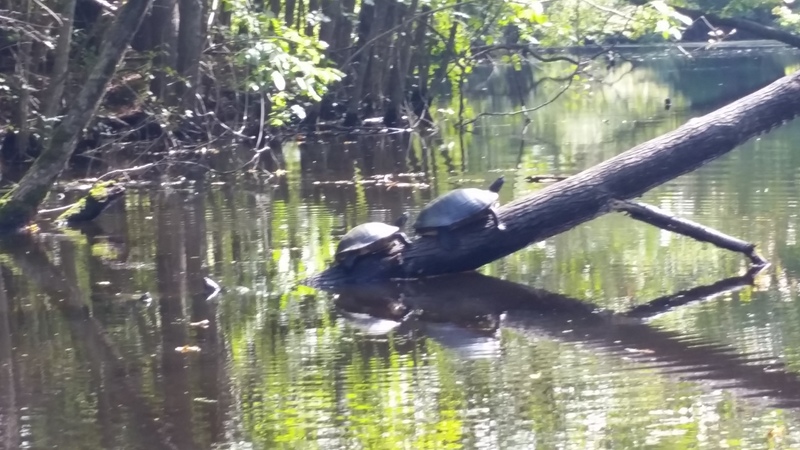 You can catch your dinner here. We had a terrific lunch, and, somewhat reluctantly, headed back to our car. We’ll do this again soon. And as an added bonus, parking is free after October 1. For Hampton Roads residents, this is a great way to see the beach, and get some exercise, with the boardwalk virtually yours alone. 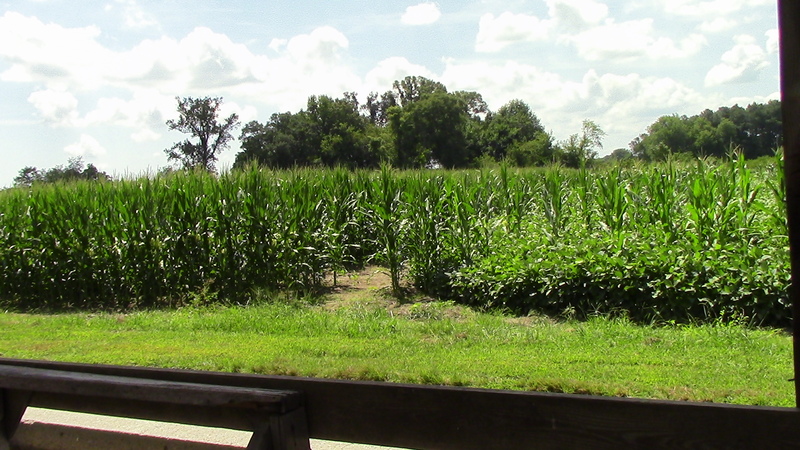 Chesapeake has some rural areas that we enjoy driving around in once in awhile. Everything is so flat, you get a chance to look at the corn and soybean fields and actually see off into the distance. Down Mt. 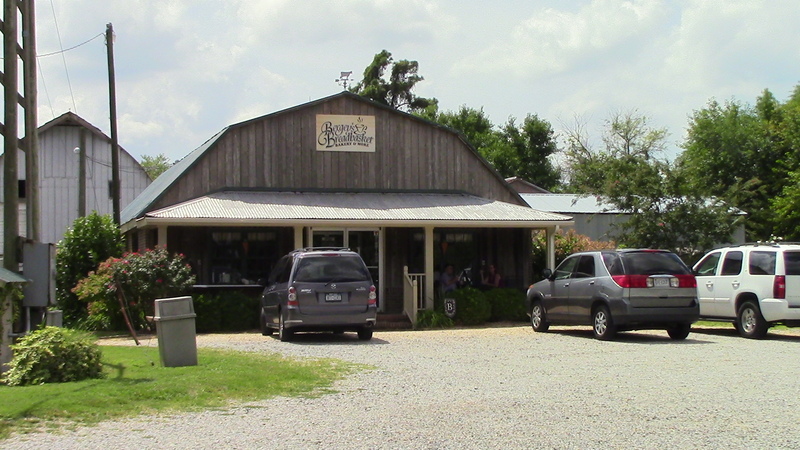 Pleasant Road is one of our favorite rural stops: Bergey’s Breadbasket. 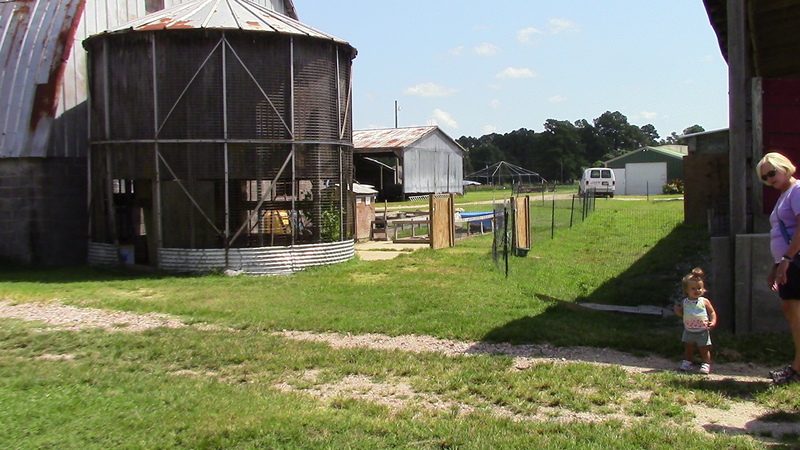 On weekends you can wander around their property and check out various farm animals and machinery…always a big hit with the little ones. There’s plenty of space to roam at Bergey’s. 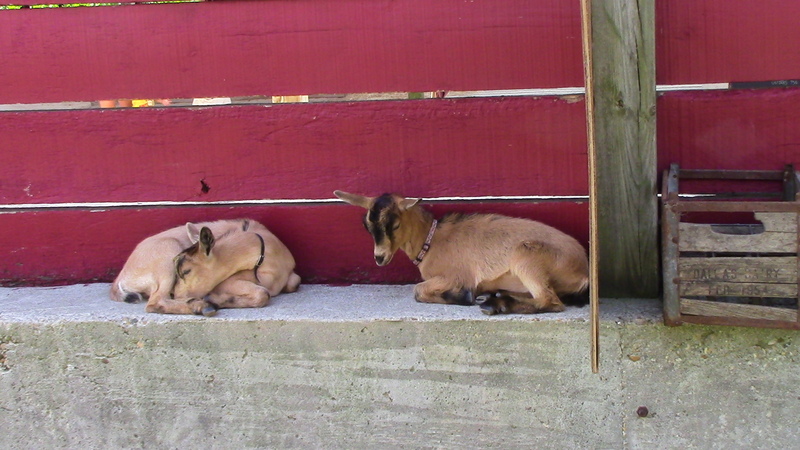 Young goats taking a rest from being petted. Our kids grew up on Bergey’s milk, which was delivered on Fridays for many years. Now you can get some delicious sandwiches and really delicious pies 6 days a week. Here’s a video of our recent visit with daughter Laura, husband Shawn, and grandkids Tristan and Virginia. The music is “Happy Farms” by Promogold. Enjoy!